When you order a custom family portrait from me you’ll receive a digital file to use however you’d like. But I know that often times we put off printing our images, so they end up sitting on our phones instead of filling our homes and making us smile. You know what I’m talking about, those vacation pictures from the beach belong on your wall! So let’s do something about that, shall we? Here are some ideas for how you can display your portraits around your home. Parabo Press prints. (I’m obsessed with this square format! I mean obviously, that’s the instagram lover coming out in me.) They come on a heavy textured paper and look so cute hanging in a grid on the wall. Use my code IIXEOV and get $10 off your order. Canvas Prints. Printed on sturdy canvas with wrapped edges around a wooden frame, these look so nice in a gallery wall with some of your favorite art! If you need some tips on how to create this look yourself, then check out this helpful guide. Magnetic Hangers. This look is one of my favorites. Printed on semi gloss sturdy canvas ready to hang in no time. And of course, the classic shelfie. A print in a frame with a simple vase is so timeless! These are just a few ideas but there are so many other ways to incorporate prints into your home. I hope they inspired you! Let me know what you think and give me a shout if you have any questions at all about family portraits or printing. xo. I do a lot of research before trips (too much to be honest), so I felt pretty prepared when we decided to move to Costa Rica for 3 months. But I’m realizing that google can only get you so far in life.. It’s been a wild ride figuring out life outside of OKC, but we’ve gotten into a groove and we’re pretty comfortable here- as long as I don’t get bit by anything poisonous, I’m good! Things the internet can’t teach you about living in Costa Rica. Everything molds, even if you thought it was completely dry when you put it away... it will mold eventually. Nothing a little cleaning can’t handle but but seriously, I pulled out my extra pair of glasses today and even those were a little fuzzy. *everything except for this backpack. I always carry my canvas one onto the plane when I fly but I really wanted to find one that would be practical for this trip, so I ordered it right before we left and it was the best purchase by far. The biggest pocket is a leakproof cooler so we use it all the time for beers and snacks to take hiking or to the beach. We don’t have a doorbell or glass windows, just screens to keep the bugs out. So when someone comes over they just yell or whistle to get my attention. “Helloooo?” “Kels?”. It cracks me up every time. The loud sound of coconuts falling and hitting the sand is as normal as hearing a dog bark, it happens all day. We’re used to it now but we still have to remember to *look up* when we’re walking to the beach. I didn’t know Netflix has country restrictions, so when we got here we realized we were blocked from watching some of the normal shows we watched at home. But there are ways around it- VPN ftw! Gotta watch Frasier somehow. Crabs and geckos get in the house all the time. At first I was freaked out but once I saw our favorite little kitchen gecko eat a mosquito, I realized that more geckos = less bugs. My skin is always shiny. I laugh out loud to myself when I think about how I used to wear highlighter on my cheeks at home so that they would look “dewey”. No problem with that here since l’m naturally dewey 24/7. I’m probably going to wrinkle up like a prune when we go home because I’ve gotten so used to the moisture. When people rake their leaves, they burn the leaf piles afterwards. It took me several weeks to get used to the smell of smoke at 3am without having a minor panic attack and jumping out of bed to make sure the house wasn’t on fire. You know when you forget to turn your straightener off, and you hope and pray you don’t smell smoke when you get home later? (no, just me?) Well that’s a similar feeling. At home in Oklahoma, we have bird poop everywhere. Here, the iguanas are the ones doing the pooping, and let me tell you.. they can do some damage. Bonus: it’s every bit as awesome as I read it would be to be able to see birds and animals pretty much everywhere you turn. We’ve seen sloths and monkeys, whales and dolphins. Basically if you want to see wildlife, all you have to do is open your eyes. Thoughts on brain fog and focus. I love documenting every little moment of our lives. I don’t have a good memory so it helps me in that way, but it’s also a fun hobby for me. I know some people can’t relate, but I actually really enjoy arranging my breakfast on the plate in an aesthetically pleasing way. 😂 And I like posting to my IG stories, adding some doodles, and looking back on what I did that day. It’s a creative outlet for me. It’s also how I find potential customers and clients, so it’s a big part of my life and business. Somewhere down the line, though, it turned into something else- something that doesn’t allow me to be fully alive in my current moment, because I’m only half there. I don’t like to admit it because it feels silly, but it’s true. I don’t know about you, but my mind bounces around a mile a minute. Always thinking about what needs to be done, what’s coming next. One minute I stand up to do laundry and the next thing I know I’m staring at my computer wondering what my purpose in life is. 🤣 So this week I tried something new (for me). I didn’t check my phone when I woke up in the morning, I focused on my present moment.. what I’m thankful for, what I wanted to accomplish that day, and I kept my social media closed until later in the evening. And man I have to tell you, it was the best. The few times I slipped up, I saw how much time I spend in Instagram when I don’t even mean to, which is the scary part. Opening one post lead me down a 45 minute spiral into looking at tiny food, which don’t get me wrong, I live for #tinykitchen. But I’m realizing that I need to have a specific time set aside for scrolling or it creeps in and distracts me from what’s going on in real life. I’m challenging you (and myself) to do a little refocusing. Be present. Make goals. Schedule out your days and set specific time aside for catching up on social media. (btw I know that “being present” is such a trendy phrase right now- but I’m all for a trend if it helps us become better humans). Unexpected things about life on the beach. This experience has already pushed me outside of my comfort zone in so many ways. On one hand there are things like living without AC and driving an hour and a half for groceries. But then there are the emotional and mental aspects of it too. At the risk of sounding like a total weirdo, I’ll tell you that I don’t meet new people very often. I have grown up and lived in the same area of OKC my whole life, and some of my best friends are the same girls that I’ve known since tee-ball. Danny and I made great friends in college that we still hang out with all the time, but that was 6 years ago - and since I work from home and don’t have any coworkers, I can honestly say that was the last time I’ve really been in a situation where I didn’t know anyone and had to meet new people. When we decided to come here I started researching everything I could about Zancudo, Costa Rica. I assumed we were going to be totally by ourselves, and truly I was mentally preparing myself to not have any other human interaction besides Danny for 3 months. Everything I read said “it feels like the end of the world” and “you can walk for miles on the beach and not see a single person”. While that’s all definitely true, there’s also a little community of people here that I didn’t read about in my googling. Our neighbor owns a restaurant so she bakes pizza and bread for us every week, and we chat daily about how things are going. Another neighbor hosts “Bloody Sundays” and makes delicious bloody marys with grilled cheese sandwiches on top for brunch. I’ve been going to a great yoga class at one of the cabinas down the street, and Danny plays Texas hold ‘em at Coquitos on Friday nights. Everyone we’ve met has been super helpful and for a tiny town in the off season, there’s a lot going on. We still feel pretty secluded because there’s only one dirt road and a small handful of people, but it’s pushing me out of the shell that I’ve always felt so comfortable in and opening me up to new people and new experiences. It’s 100% different from what I expected, but it’s exactly what I needed. So we’ve officially been house sitting for a week. We’re living in a new country, learning new routines (more on that later), meeting new neighbors. There have been some interesting moments for sure, but all in all it has turned out to be better than I thought it could be. Life without AC has definitely been the biggest adjustment. All of the windows are screens so we have 3 fans pointed on us at night and an ocean breeze during the day, it’s not terrible but it’s pretty steamy at times. I think my body is getting used to it though. Haha. The people here live a much slower paced life. There’s one dirt road in our town, two grocery stores, a small handful of restaurants. It’s the most simple, laid back community I’ve ever visited. Since it’s so remote and most people don’t have a car there is a fruit and veggie truck that comes by twice a week. He parks out front at 9am and honks his horn to let us know he’s there, then we go out and pick what we want and pay him at the back of the truck. It’s one of my favorite parts so far. Some people have been asking me how it works so I wanted to answer some questions about house sitting here. Is it a paid house sitting job? No, most of the ones I’ve seen online are a free swap. You stay for free and they get a free house sitter, it’s a win win. How did you get it? I just made a profile and applied with Trusted Housesitters. I think the key is to tailor all of your applications to the particular house sitting job you’re applying for- similar to any job application. Also make your profile look good, put some time into it and be quick to respond to listings. How many people apply? Ours had over 150 people contact the owner but he only interviewed a couple applicants. Like I said, tailoring your application will really help you stand out. If you just copy/paste the same line that says, “I love pets and I’d love to take care of your dog” and then you apply for a house sit that doesn’t have a dog, that shows you’re not really trying. What are your responsibilities? They’re all different, but at our place all we really have to do is be at the house overnight. We turn the porch lights on and off, take care of the chickens, sweep the pool sometimes. There is a house keeper and pool caretaker so it’s pretty well looked after, we’re just here for extra security. But, why Costa Rica? And why 3 months? We’ve visited Costa Rica twice before and knew that we loved it, and it felt familiar. This house sit in particular was for three months but they all vary, some are just one or two weeks. Here’s to learning new things and experiencing a different culture, even just for a little while. xo. At the beginning of 2018 I decided to stop making my plush taxidermy (traveling a lot for my husb’s work made it difficult), and I spent a few months in a weird limbo wondering WTH I was going to do with my business. For a second, Danny and I thought we were going to open a small music venue with some friends in OKC. We hit it hard for about a month I was like ohh ok, I’ll be working at this place all the time now, this is my new life plan. 🎸🍻🎤🤘🏻We ended up running into too many roadblocks, but the planning process was super fun for me and I think we’d love to try again in the future. In the meantime I started sketching, just for myself mostly. Sunny beach inspired art. Then I put myself out there and one thing lead to another and I got a few really fun opportunities that made me excited about my business again, and I felt like I knew what I was doing. Fast forward a few months, and we were sitting on a plane on our way to Zancudo, Costa Rica to housesit for the next three months. It really happened so quickly, we decided on a whim to apply and then got accepted and were gone less than three weeks later. Every time we go on vacation we talk about how awesome it would be to move to the beach, but how sad we would be to leave our family and friends. So this is the best of both worlds! It’s long enough to give us a taste of Costa Rican life but short enough to not make us feel like we’re uprooting our entire life back home. So far this whole process has been the most spontaneous, outrageous thing I’ve ever done. It probably doesn’t seem like a long time to most people because a lot of people study abroad or move out of state for a job. But I’m a pretty anxious person and I’ve never left home for more than two weeks (even though I love to travel, my traveling is mostly 5 nights or less). Basically what I’m saying is, don’t bog yourself down thinking about your life plan for the next 5-10 years. Take it as it comes. Take chances. Do something that feels exciting and scary and hope for the best. If I was still busy sewing custom orders and feeling comfortable with my business, then I might never have gotten restless, never started dreaming about doing something a little different. Honestly I have no clue if this is going to end up being the best experience of my life or if I’m going to be crying in a month wanting to go home early and sleep in my own bed. But I’m hoping for the former. If you have someone you frequently travel with and want to get half of all of your flights for free (I mean, who doesn't? ), then this post is for you. I just spent way too much time booking our flights to Turks and Caicos, comparing cost breakdowns to see if it's a better value to book with cash or points. I wanted to share my findings with you here because A.) I'd love to save someone else the headache of figuring it out themselves and B.) somehow turning my 2 hours of research into a blog post makes me feel a little bit better about myself. So, here's the breakdown of how we saved over $400 by booking with points and using our Southwest Companion Pass. Every SW point = 1.5 cents. Converting points to dollars, it comes out to $411.44 for one roundtrip ticket, fees included. If we booked using cash instead of points, the total cost would have been $457. So, we already saved $45.56 by using Southwest points instead of paying cash. Now, in comes the beautiful Companion Pass, which lets your designated partner fly free with you on every trip for *at least an entire calendar year. With your pass, you only have to pay taxes and fees, which varies by country for international flights. Plus - in case you're not familiar, you get two free checked bags apiece on every SW flight. Yep, even your companion. We usually carry on, but in those times when you need to bring a lot of sunscreen (Caribbean vacay, y'all) it's nice to check for free. Now, I was curious about how much we were actually saving by booking specifically with Southwest (because that's how I get my kicks in life, lol) so I looked into how much it would cost for both of us to fly to T&C on a different airline. The cheapest I could find was a combination of Delta and United, which costs $1,142 for two roundtrip tickets, plus $50 per checked bag (um, plus a 16 hr layover? bye). So, compared to the $514 we spent booking with Southwest, that's $627.15 in savings, not even counting baggage fees! And that makes me so dang happy. We just got our second Companion Pass, so we're going on 3 years of free flights and let me just tell you, it never gets old. - These prices are reflective of flying to the Caribbean from the Midwest area. If you live in Florida your ticket will be chump change compared to these prices, on any airline I'm sure. I envy you. - You do need to get two Southwest credit cards to get the Companion Pass. Although it might seem tricky to juggle multiple cards, we use ours as if they were debit cards. I get on and pay them off a few times per month so that we never have a balance and never pay interest, which is just a personal preference but something I wanted to note. - The fees that you'll pay for your companion ticket on domestic flights are WAY cheaper. * The Companion Pass can last you more than a full year, depending on when you get it. See my post here for more details. We went to New Orleans last year for Easter and it ended up being an unexpectedly colorful trip. I didn’t know much about NOLA beforehand but I came away loving the laid back vibe and wanting to make a tradition of it and go back every Easter. The weather in April was amazing and there was enough going on with celebrations and parades to feel like we were getting a true NOLA experience without the crazy crowds of Mardi Gras. We decided to stay in an Airbnb in Bywater (the green garden house below) and I'm so glad we chose that spot! It was just a short bike ride through the newly redone riverfront park to the French Quarter or any of the other NOLA sights, and couldn’t be any cuter with its bright bungalows and corner cafes. I’d definitely recommend it if you’re looking for a quieter place to sleep but still stay close to the action. We stayed in a private two story guest cottage with a balcony and free bikes -direct link here. It's safe, clean and comfortable (not to mention adorable), and it has a full kitchen with plenty of room to spread out and make yourself at home. If you've never used Airbnb before, its a great way to get a feel for the neighborhood instead of feeling like a total tourist, and you can use my invite for $40 off your first booking. Top row is from Elizabeth's in the Bywater- really is a must for brunch. The praline candied bacon and bloody mary were amazing, and I loved my shrimp and grits too! Bottom row images are from Frenchmen Art Market and I'd definitely recommend it for a nighttime activity. Frenchmen is such a fun area to explore by bike or foot, with tons of restaurants and local music, it's like a hip version of the French Quarter and it can easily keep you busy for hours. The French Quarter, obviously! Catch a parade. Explore the shops. Admire the architecture. Shout out to all of the 12 year olds on youtube that make how to videos for us middle aged girls just trying to put together a little travel vlog. They make it seem so easy (but it's so not). Valentine's Day is coming up, Galentine's Day is coming up, it's the best time of year for being thoughtful of others and for treating yourself to something fun! I'm planning to do a few short and sweet round ups here to inspire your month of love and first up is one of my faves, La Croix. I drink at least 3 of these every day and I can confidently say they are the reason I stay hydrated. Plus I’m all about their summer vibes and I love the colorful designs. Hand painted heart pins so I can wear my fave flavor as flair for everyone to see. You can find them in my shop here! #coconutforever, PS. Home is where the la croix (so much of it) is art print. These little hand stamped gold necklaces are adorable! Hand stitched la croix patch. All the sparkling water flair! 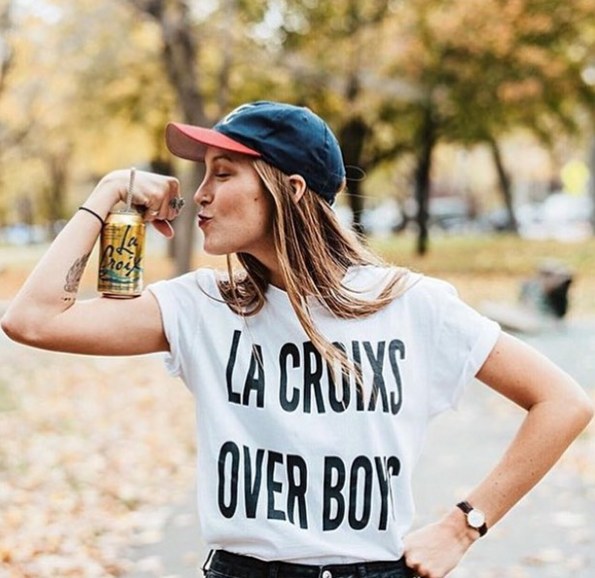 Uhmm hi, I want this la croixs over boys tshirt. So cute. And last but definitely not least, I'll leave you with 15 La Croix cocktails. Because what is Valentine's Day without a Guava Pineapple and Coconut cocktail made with vodka and coconut la croix? Or a Spicy Paloma with tequila and Pamplemousse? What a dream. There are the items on Amazon that you already know you need, like blenders and printer ink, and then there are the ones you never knew you needed. I rounded up my favorite purchases that I use regularly and at this point feel like I couldn't live without! If you know me, you know how much I love our magnetic screen door. We bought it as a temporary solution for our Halloween party two years ago so that we could leave the door open and let people easily go in and out, without letting a bunch of bugs in. I expected it to fall down after one night but its still in great shape and I love nice days when I can leave the door open and let the breeze in! It's wonderful. Maybe my favorite Amazon purchase ever. For you Apple pencil users, this desktop charger/pencil stand is awesome. The charge lasts longer and it holds the cap so you won't lose it. I'd also recommend a magnetic sleeve grip. Not only is this little desktop vacuum cleaner adorable, it works great for cleaning up small messes. If you're like me and you pretty much ALWAYS have pencil shavings, glitter, or little bits of stuffing scattered everywhere.. you need it. If you take product photography for small items this portable light box is a must. It has an LED strip included so you just plug it in and you're set, no additional lights needed. I use it for my pin pictures and it works great. Also, if you need a tripod to record time lapse videos of your work from above, this is a good one. It clips to the side of your desk and can hold phones or small tablets. I'm obsessed with this fisheye lens the clips over your phone camera. It also has a macro lens underneath. So fun! Okay this is a little yuck but I'll tell you anyways. There are a TON of stray cats in our neighborhood (like 25+, no joke) and sometimes fleas sneak in our house through little holes around our kitchen sink plumbing. We had an exterminator come out and that didn't help, nothing worked until we bought this flea trap from Amazon. It's a simple idea and you could DIY something similar, basically it's just a warm light and a sticky pad. Once we started using it and if we use it on a regular basis, we don't see any fleas at all. I've been using this purse everyday since 2015. I actually didn't realize it had been that long until I looked at my purchase history.. but dang, it's held up really well. The Trtl neck support is a good alternative to regular travel pillows. It wraps around your neck like a scarf and supports your head to the front or side. You can cozy it up around your face which is nice because I don't want anyone to see if my mouth falls open while I'm asleep. Haha. Those are my faves! And mostly all less than $30. Do you have any random Amazon purchases that you love? As of today, almost three weeks after Hurricane Maria, only 9% of citizens have electricity, and only about half of them have access to drinking water. These people are bathing in the streets, living in the dark, and are without the most basic necessities.. that continues to blow my mind. We visited in January and I've been recognizing a lot of the names of towns and beaches on the news, restaurants we went to and houses we walked past are destroyed. We stayed in an amazing little bed and breakfast near the rain forest and the pictures of their damage breaks my heart. I just haven't been able to stop thinking about this beautiful place. Normally this would be in the same "Go Here" format as my other travel posts, where I list our favorite places to eat and things to do. But in this case I just want to post these pictures to remember what a beautiful place it was, and hopefully will be again one day. At El Yunque Rainforest, the main waterfall La Mina was super crowded. We went across the street and found Juan Diego falls, aka the secret falls, and we had the place to ourselves. It was beautiful. Day trip to Culebrita, the most perfect little beach I've ever seen. I'll be donating 100% of the proceeds from my slightly imperfect enamel pin sales for the next few weeks to Save the Children, who are on the island and providing much needed relief to children and their families. (Slightly imperfect pins means there might be a little air bubble here and there, things you can barely see but are cause for a discount.) You can purchase pins and donate to PR from my shop here.